How is everyone? Hopefully, you all had a fabulous weekend. Ours was lots of fun and busy including a trip to the mall to see Santa. I think Reagan was most excited about the fact that we ate Chinese food at the food court. She's at the age where she's just not really into Santa anymore! Sunday the boys had a gymnastics recital. It's always fun to see them do their routines. Tyler has been on prep team for 2 years now and is doing so very well. Jonathan isn't quite as advanced; but he sure is cute to watch! So, let's talk about today's card, shall we? 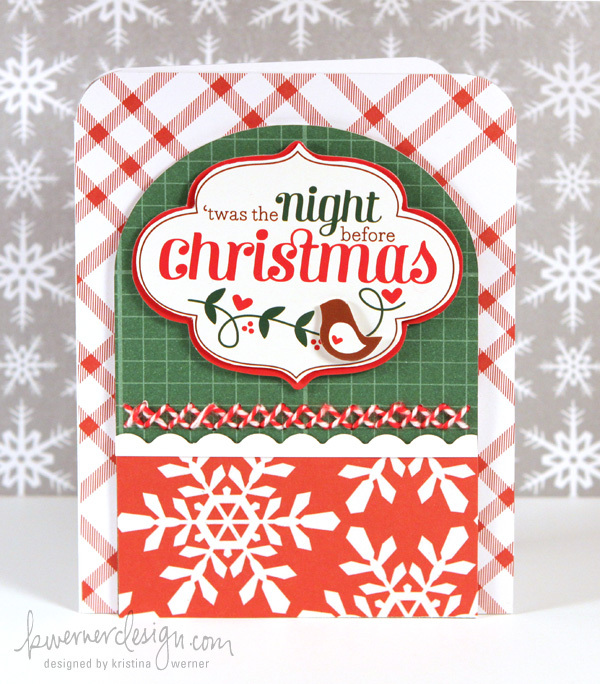 Lots of fun patterns going on with this card. I was also pretty pleased with the fact that I was able to cut a pretty decent curve from the top of the center panel piece because I'm not always the most competent with the scissors! I tried to pull a lot of colors from the ornament pattern paper to coordinate the front panel of papers. I think the otherwise non-conventional colors would not coordinate together as well. I didn't think these patterns lent themselves very well to a lot of images, so I opted to just put the sentiment in the center. Kristina used a a dimensional sticker for her center image on her Night Before Christmas card that took up a little more space in her center than mine did. I also decided to add a ribbon at the bottom because I just thought my bottom portion was a little bare. I hope you like it and thank you so much for visiting with me today. I'll see you all tomorrow! Both your cards are great. Love the patterned papers. Thanks for playing along with us at Scrappy Frogs. What beautiful cards, I love the layout and colours! Thank's for playing along with The Squirrel and The Fox. ***Merry Christmas*** hope we will see you again next year! What a fabulous combination of texture! 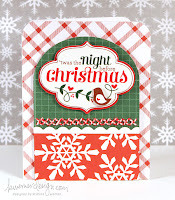 Thanks so much for joining our 'Anything Christmas' challenge at Paper Sundaes.